I bought a Mocante in the wood case. 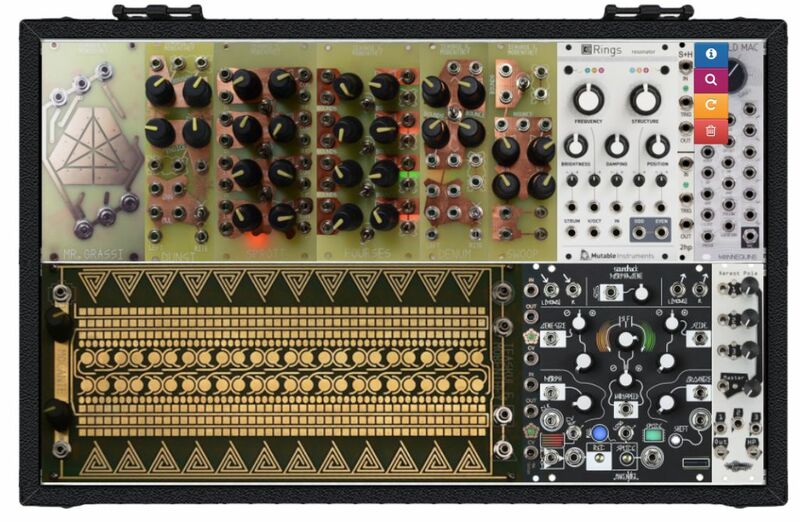 Now I have relocated it into a Eurorack box that adds a lot of processing. Meng Qi pointed out that Mocante is longer than the 54 HP given in the PDF manual and on Modular Grid. He thought it was 56 HP, but it's actually 55.625 HP, by my measurement. I was lucky, because I planned 88 HP, due to the Cell 90 case being a bit shy of 90 HP. Everything fits snugly. I discovered that I can inject Mocante signals into Unknown Pleasures just by touching them both. Mocante can be heard through U.P. this way, without any patch cords! That looks like a fun setup. I am wanting to do the same with my IFM keyboard. I was wondering if its not too much of a hassle could you please explain about how you converted the Mocante to work in your euro case? My Mocante doesn't have a Euro power header on it and I am not completely sure how to go about adding one. If you could post some pictures of the back of the PCB that would be super helpful, thanks. 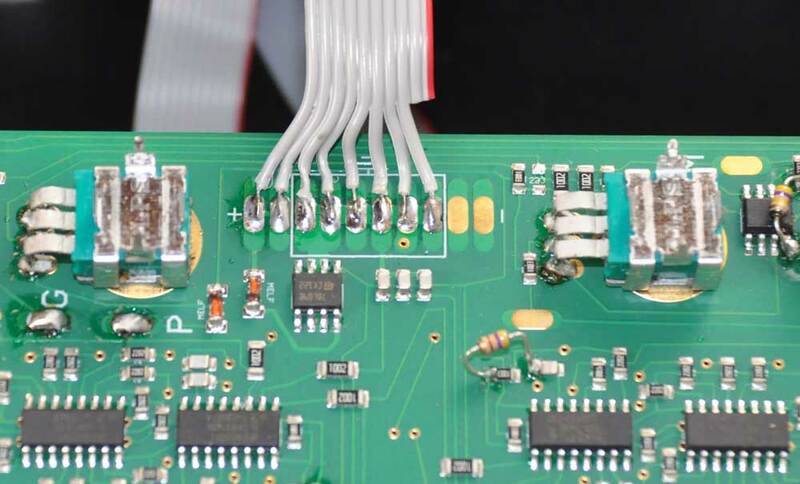 If you can solder, it's easy. I cut the header off one end of a standard Euro power cable (10-pin). There are 10 pads in line on the back of the Mocante that match to the standard cable. There's even pads for the -12V wires, which don't connect to anything on the PC board. I will take a photo. Okay that makes sense I think. A picture will help clarify it for me. I have a limited amount of electronics knowledge but am good with a soldering iron. Thanks again for taking the time to do this. The cable is a standard 10-pin euro power cable. Left to right: 2 wires are +12 volt, then 6 wires of ground, then 2 wires of -12 volt (red stripe), which I did not bother to solder, even though there are pads on the PC board. Those pads don't connect to anything on the board. Previous post updated with photo. Thank you so very much kind sir. This is perfect, going to mod mine tonight. Planning to buy a Mocante but haven't pulled the trigger yet. Can anybody share some audio? I am not familiar with its sounds. Makes sense as a controller. Do you have any videos of you own? Really looking forward to buying one of these, but there isn't enough info out there. I've been making a lot of changes to the support modules in this box. One of them is going to be a Pico DSP. I'll be making an updated post. We could make a video too. +1 for more mocante, igm keyboard vids! Mine didn’t have the 9v plug, just a single power adapter jack on the back. After I finished soldering the cable I tried continuity testing and was dismayed to find a single line was apparently connected to multiple pads. Then I reread Richard’s post and realized that the two +12v pads are continuous with each other, and the six neutral pads are also continuous with each other, too. Since my soldering wasn’t nearly as nice as Richard’s, I was glad not to have inadvertently shorted the pads. In any event it works perfectly. I also have a spare wooden case which I am happy to pass on to anyone who wants to mount their Mocante in a separate case... instead of posting it on BST where it will vanish, I thought I would post it here. Just PM me if you need it. Nice. I still have my wood case, too. But who would need it? Here's my latest load for the Mocante Rack. Added Mr. Grassi. Today was day one with this case. Pretty revelatory. I especially like the way an unpatched Mr Grassi interacts with Mocante. And Rings is a surprisingly fun pair for IFM. Have you tried using the Landscape All Flesh with IFM modules? There are a number of jacks that respond pleasantly when a cable tip is touched.